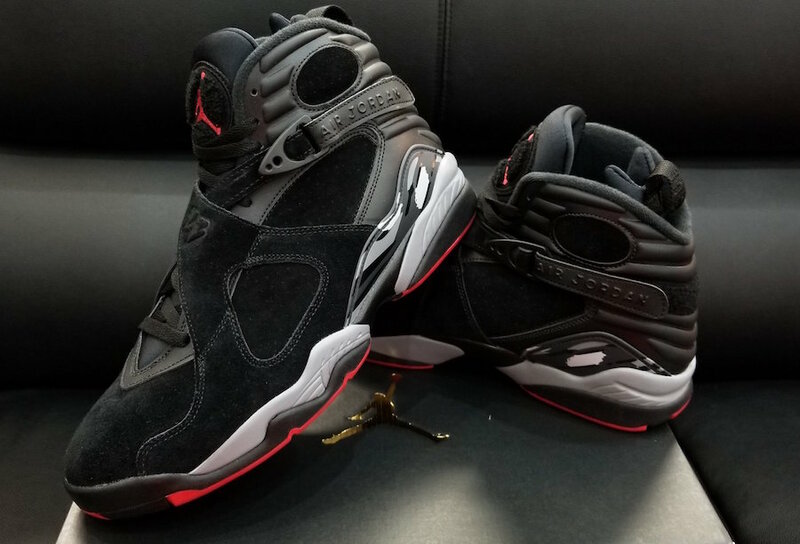 The fire releases just keep on coming with this first look of the upcoming Air Jordan 8 “Cement”. Playoff 8’s are the first thing that come to mind here, but the shoe definitely has its differences. It features an all-Black upper, constructed with a combo of leather and nubuck. What’s unique here is that the heel panel looks to be leather, where its typically a soft nubuck. Wolf Grey is splashed on the shoe’s midsole print and classic side guard. The Gym Red rubber outsole completes the Bred look on this alternate version of the 1993 classic. Watchout for these to release this Summer at select Jordan Brand retailers and online at Nike.com for $190. Stay tuned for the official images and release dat when they arrive. You can catch your first look below and make sure you stay up to date with all upcoming releases via our Release Calendar. For more Jordan news, click HERE or to catch all the latest Jordan Release Dates, click HERE! Official images and a release date have been confirmed by Nike. Check out the details below!